We talk of tensions in our muscles and in the way we breathe. In everyday life, however, we tend not to notice irregularities and unconscious reactions in our breath. We are accustomed to them. In our muscles and our pattern of breathing, experiences are stored, which have left traces in our unconscious mind. “Breathe slowly, deeply and silently, without any interruption between rounds …” This is the beginning of Nadi Shodana, The Alternate Nostril Breathing. When we work with the breath, it becomes possible to gradually let go of such tensions – this gives us strength to deal successfully with problems and energy to leave depression behind. Having had a few bad experiences in life does not mean that we cannot accomplish anything further. The body’s finer energy flows are cleared of blockages and inhibitions, which hinder the free passage of thoughts and feelings. Such hindrances often dull our senses and can be the cause of a troublesome emotional life. We lack the strength and harmony which ample and evenly distributed energy gives us. “A person with a strong and radiant glow”, we say. If we stop and think about it, the words reveal that we are speaking of energy; of being present without diminishing ourselves, of being receptive and creative – able to experience and communicate. The yogic breathing methods make us aware of our energy, so we can master it. 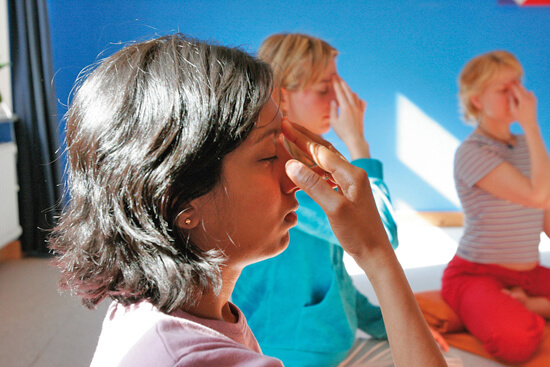 This is the meaning of the word Pranayama and the purpose of these methods. Read more about the Yogic Breathing Exercises: Why hold the breath?